Volkmann Vacuum Conveyors transport and feed all types of powders, granulated materials, dust, pellets, fibers, etc., meeting the difficult requirements for the conveying and handling of chemicals. 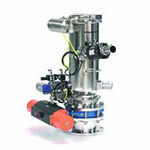 Vacuum conveying capacities of 25 lbs./hr. to 20,000 lbs./hr.